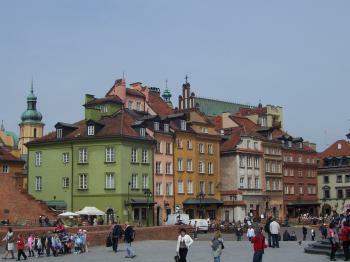 The Historic Centre of Warsaw is a near-total reconstruction of a city center from the 13th to 20th centuries. Warsaw was razed in August 1944, during World War II, by Nazi occupation troups. About 85% of the city had been destroyed, including the historic Old Town and the Royal Castle. After the war a reconstruction campaign resulted in the rebuilding of monuments like the Cathedral of St John and the Town Market Square. The two reviewers on the left are right: Warsaw is a pleasant city. Broad streets, a lot of green. The Old Town is quite small, but has a stunning central square with authentique houses (though rebuilt after the war). The Royal Castle is one of the city's most prominent landmarks. The outside is not what you would expect of a castle (more like a convent). Inside there are lots of luxurious rooms, with gold, red and marble. I went with friends to Warsaw in April 2015 for the 17th International Chopin Piano Competition. Whilst there, we took the opportunity to explore the Historic Centre, which is a pretty small section of the centre of the city that showcases what the area was like prior to its destruction by Nazi Germany in the Second World War. Over 85% of the city’s buildings were destroyed in the war, as depicted movingly in the Roman Polanski film The Pianist. It was in response to the Warsaw Uprising of 1944 that the Germans took the decision to annihilate the city, destroying over 700 years of historical buildings ranging from the thirteenth to the twentieth century. The remarkable thing about what the people of Poland achieved in five years after the war was that they followed historical plans and imagery in great detail, enabling them to rebuild the city very much as it had been. For a big European capital, Warsaw does not have a large number of attractions, but enough to spend a pleasant day or two. The reason for the relative lack of sights is of course the immense destruction it suffered during WWII, and the Old Town was meticulously rebuilt in the following decades. If you don't look too closely, you could believe that you are walking through a town with many authentic medieval, Renaissance and Baroque buildings. The restored centre is quite small, however. Apart from the Old Town, the (in)famous Palace of Science and Culture merits a visit for its panoramic views of the city. Warsaw's Old Town is a dream for every city break. A large part of the old town was destroyed during the Second World War, but rebuilt. There are also plenty of small shops and restaurants that invite you to a short stop. The old town flows from an incredible charm. Like Jorge I stayed at the hotel Gromada near the airport, as I was leaving next day for Riga. Very conveniently bus #175 stopped outside the hotel and took me directly to the Stare Miasto. So I was able to maximise my time visiting the WHS, first in the afternoon, then again early next morning. I enjoyed seeing the imposing Royal Palace and the colourful baroque buildings surrounding the squares. 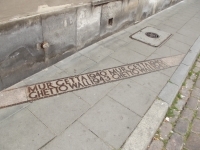 But in addition there were the more sombre reminders of the Ghetto, the Nazi persecution and the Uprising. I was really impressed by Warsaw. I had heard some pretty mediocre reports about the city from others that had visited, however I really enjoyed the two days I spent there at the start of my little jaunt. The World Heritage Site itself is the reconstructed old town, and whilst it may not be as glorious as some of the other Central European cities on the list, it has an incredible story of rebuilding after near total destruction. It was actually a little bigger than I was expecting it to be, and the sgraffito wall decorations were some of the finest examples I have seen. It is pretty evident that this site has been rebuilt, however I think this is quite good as it enables people to ‘read’ the restoration, instead of just trying to pass it off as being more authentic. I kept on returning for strolls down different streets and think I probably walk down every one with-in the WHS. Aside from the old town I really liked Warsaw, admittedly the Central station is a little grim looking but there are plenty of other worthwhile places to visit; most strikingly the Palace of Science and Culture, but we also had great fun venturing off to more remote parts of the centre to see the monuments and museum relating to the history of the city in the Second World War. Perhaps my favourite thing though was the relaxed atmosphere we found, from queuing in Milk Bars to bar hopping in Praga, however my favourite ‘find’ was the network of ‘Pawilony (Pavilion)’ bars located just behind Nowy Swiat, these slightly shabby looking exteriors actually housed some of the best drinking establishments I have come across in Europe. If you are wanting to uncover a few more of Warsaw’s hidden gems then I can highly recommend the free 'Use-It' map ) this was almost invaluable to us. Overall I really enjoyed my time in Warsaw, it was a fun relaxed city and the Historic Centre was the icing on the cake. It has a great story to tell and the restoration is done in such a way that you can read this story in the reconstructed townscape. Interesting place for those who want to learn more about the History of the country, especially, during the WWII. The city center is OK but, please find time to visit the Warsaw Rising Museum (Muzeum Powstania Warszawskiego), the house of Mary Curie and the memorials and Gestapo prisons related also with the WWII. 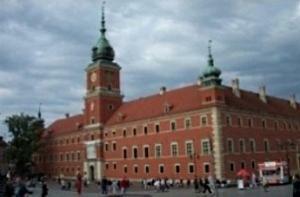 Some weeks ago I enjoyed for one week the wonderful and interesting town Warsaw and I liked it very much. Especially the combination of the old and the new in this town is quite interesting. A special impression for me was also the performances in the opera house TEATR WIELKI (e.g. BALLET DE LORRAINE, THE QUEEN OF SPADES ). The market-place is really wonderful. But one negativ thing I have to mention with this old town square: Unfortunately it was started to change the wooden windows to plastic windows with no proportions and other dimensions. It would be terrible if more houses would change in this way. So please stop these plastic windows otherwise the market place would look like a plastic Disney World and the place would loose its wonderful atmosphere. After hearing mixed reviews of the Polish capital, I decided that it would be worth checking out. I headed there from Krakow and though first impressions weren't the best [the Central Train Station was quite ugly], my mind was changed once I got to discovered the rest of the city. The area known as Srodmiescie, with it's skyscrapers and modern buildings blends in with XIX century tenements and eventually the city's historic core, which can be reached by walking up the colourful promenade known as the Royal Route. It looks quite original and I have to say that the conservationists did a good job reconstruction the street. The Old Town and New Towns are interesting as well, offering everything from over-priced dining and junk to really good Italian Ice Cream. All in all, it's a nice place to idle around. The city itself is one that is in a state of transformation. The grime and greyness that so many associate with it is slowly being replaced with glass and steel and fresh paint. In 10-15 years, it'll be a totally different place. Though it's not Krakow, I recommend Warsaw, especially if you enjoy modern architecture. Bureau - ICOMOS supports but concern about reconstruction -Bureau divided! Diplomatic Missions of Joseon Envoy Min Yonghwan: 18 May 1896 (Lunar date: 6/4) Clear weather. "At 11:00 A.M. we set off again, travelling 400 leagues. At 2:00 P.M. we arrived in Warsaw, the former capital of Poland...I heard that this country used to be a most enlightened and independent country, but more than a hundred years ago it gradually became politically weakened. Officials and nobles mistreated the people, and there were frequent rebellions. These could not be suppressed, and finally the three countries Russia, Austria, and France divided the land between them. Perhaps this is a warning to those who are governing our country ..At night outside the shops on either side of the street, torches can be seen burning like a continuous rope of fire. This is the first time we have seen such a thing since we came to the West." Napoleon was here: "Climb up ul. Kamienne Schodki to get back into the main square. Not only is this the longest stairwell in Old Town, it?s also where Napoleon allegedly stood in 1806, pensively staring eastwards as he planned his campaign against Russia"
Hitler was here: He received the Wehrmacht parade in Warsaw on October 5, 1939. OUV provided by Reconstructions: "Criterion (vi): The Historic Centre of Warsaw is an exceptional example of the comprehensive reconstruction of a city that had been deliberately and totally destroyed. The foundation of the material reconstruction was the inner strength and determination of the nation, which brought about the reconstruction of the heritage on a unique scale in the history of the world. 350 Community Members have visited.